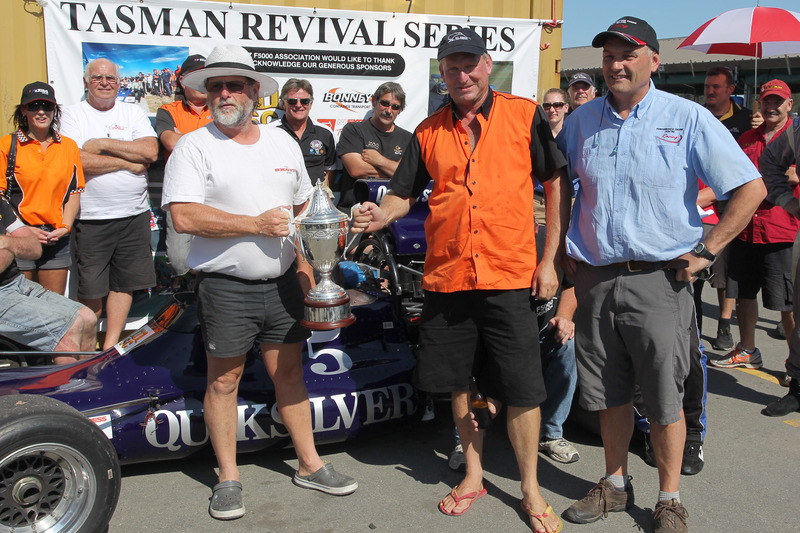 McRae GM1 driver Steve Ross was one of two MSC NZ F5000 Tasman Cup Revival Series winners on the second day of competition at the fifth round at the annual Skope Classic historic motor racing meeting in Christchurch over the weekend. Ross qualified quickest and won all three Mobil1-backed MSC category races. But after the 12-lap feature final on Sunday afternoon race runner-up Brett Willis (Lola T330) was named the winner of the Stan Redmond Memorial Trophy. Redmond was a leading light in the MSC series from its inception and the Trophy was minted after his tragic death behind the wheel two years ago. The trophy is awarded to the MSC series driver who puts in the most spirited performance at the Skope Classic meeting (held at Redmond’s home circuit, Mike Pero Motorsport Park nee Ruapuna) and this year Willis, who worked his way from seventh spot on the grid to second at the flag, was a popular choice. “It was certainly a great way to finish the weekend, and great for the team,” he said. After winning the first MSC series race of the weekend on Saturday from Napier driver Sefton Gibb (Lola T332) and British-based series regular Greg Thornton (Surtees TS11), runaway series points leader Steve Ross looked set to romp home to two more wins on Sunday. He did too, but not until he learned the hard way just how close the likes of Gibb and Thornton are now to his pace. After grabbing an early lead in the morning’s 8-lapper Ross eased back, and paid the price, running off the track and being quickly bumped back to second by a grateful Gibb then third by Thornton. “It was a lack of concentration, then I tried to push it a bit too hard,” the two-time series champ admitted afterwards. Gibb led the race for four laps in all, with Ross getting back past Thornton for one lap, then losing the place and having to do it all again the next. In the end he did get back into the lead, with Gibb second, Thornton third, Aussie Paul Zazryn (Lola T332) fourth and Russell Greer (Lola T332) and Brett Willis fifth and sixth respectively. Ross made sure he didn’t make the same mistake in the 12-lap feature race in the afternoon, accelerating away to an early lead off the rolling start from Gibb, Zazryn, Thornton, Greer, Ian Clements (Lola T332) and Willis. Paul Zazryn then made a successful pass on Sefton Gibb for second into Turn 1 before setting off after Ross. At this stage Ross had an almost four second buffer but Zazryn pushed on ahead of Gibb, Thornton and Aaron Burson (Talon MR1A) with Brett Willis tucked in behind. Gibb appeared to slow on the sixth lap, allowing Thornton to catch him then Gibb’s race came to an end two laps later when an input shaft broke. By that time Willis had got past Burson and used the opportunity to take Thornton as well. Zazryn remained in second place but was slowing as he started struggling for front turn-in grip, allowing Willis – on a real roll by this stage – to get closer and eventually pass for second place with one lap to go. “The front tyres were going off after the halfway mark which was causing understeer. He (Willis) was quicker so it wasn’t worth holding him back,” explained Zazryn. While the large crowd was focused on Willis and his climb through the field, Aaron Burson also managed to find a way past Greg Thornton, and David Arrowsmith pulled in with a broken muffler on his borrowed Lola T430. 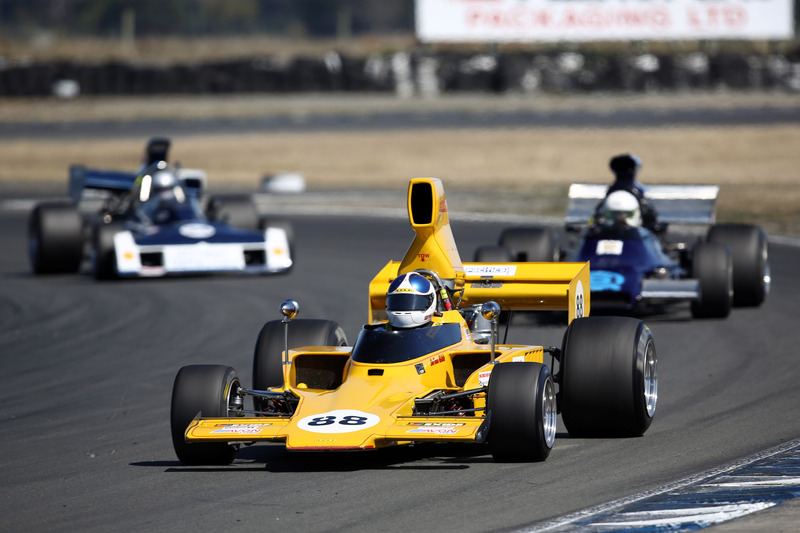 The Mobil1 MSC F5000s joined the Harold Heasley Saloons, Stanton Brothers Sports and GTs, PKMC Muscle Cars, Pat Hoare Formula Libres and NZ Pre-65s on a packed programme at the Skope Classic meeting this year. The series now returns to the North Island where the final round will be held at the 2015 New Zealand Grand Prix meeting at Manfeild next weekend. 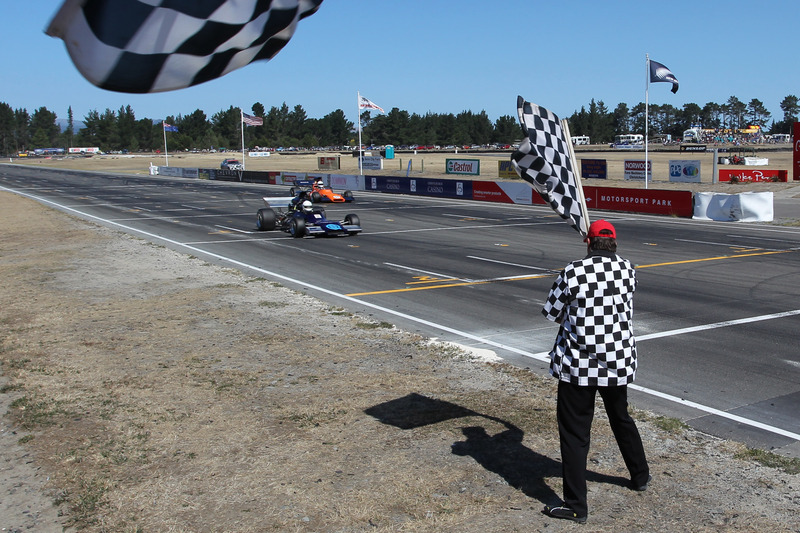 Dunedin’s Steve Ross (McRae GM1 #5) takes the chequered flag to win the feature MSC NZ F5000 Tasman Cup Revival Series race at Mike Pero Motorsport Park on Sunday. Steve Ross leading Sefton Gibb and Greg Thornton in the weekend’s second MSC series race on Sunday morning. Brett Willis (middle) flanked by Canterbury Car Club president Gary Johnstone (left) and the late Stan Redmond’s engine man Steve Weeber (right) with the Stan Redmond Memorial Trophy he earned for the most spirited MSC series drive of the meeting. And race 2 race leader Sefton Gibb (Lola T332 #88) leading Steve Ross and Greg Thornton (Surtees TS11). Photo credit: Fast Company/Alex Mitchell.